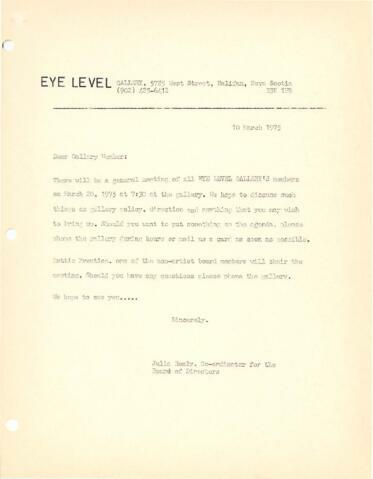 Item is a typed memo by Eye Level Gallery notifying the general members about a meeting held on March 20, 1975 at the gallery's location at 5785 West Street in Halifax, Nova Scotia. The letter is from Julia Healy, the Co-ordinator for the Board of Directors of the Eye Level Gallery. Item is a typed letter on acidic paper.